Modern grades of gladioluses are the result of a long-term and laborious work of selectors. Annually is registered to 100 new grades of gladioluses. Landing of gladioluses to the earth is carried out in the spring and dug out in the fall. The soil under landing is prepared in advance, dug over on depth of 30-40 cm along with application of fertilizers in the fall. In the spring the earth is dug over repeatedly, allowing the soil to dry up. Land when the earth gets warm to +10 degrees, since the end of April till May, on depth of 8-12 cm. Between plants leave distance in 15 cm. At disembarkation by ranks, a step between ranks - 30 cm. In the fall of a bulbous tuber dig out, clear, sort and dry in well aired place. For good ripening bulbous tubers need 35-45 days after the end of blossoming. 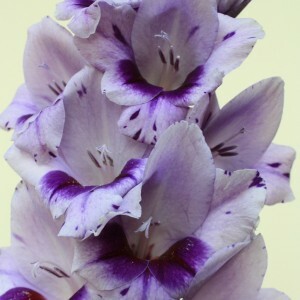 It is recommended to breed gladioluses before disembarkation in soil. A box should be placed in a warm, light place. In time couching sprouts on gladioluses have to start in growth, and roots shouldn't start being formed yet.